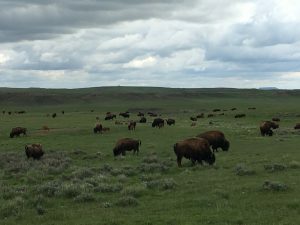 Calving bison on the prairie, with nothing but grass and sky as far as the eye can see. It is a scene which, without knowing any better, could have been identical to what I would have seen if I stood on this ridge three hundred years ago. For anyone who knows better, however, it is clear something is missing: more bison. Had the photo been taken before the 1800s, the photo would have adhered to the photography rule of thirds: the green grass, the blue sky, and the brown bison. In my photo, however, the bison are mere spots within the green and do not fill the frame as much as their ancestors would have. As I turn around, imagining what such an immense herd would have looked like, another staggering image marks the opposite hill top and I am reminded of why the herd behind me is so sparse: an oil well. Oil pads, drill rigs, natural gas wells, and coal mines are prevalent in this area of eastern Wyoming, and to have bison living and breeding here could be deemed ironic or even poetically cruel if bison could grasp, or even care about such concepts. To grasp the irony, one must know a bit of history: Before European colonial settlers arrived, it is estimated that over sixty million bison roamed the continent. But by the turn of the twentieth century, there were about 500 bison remaining, and their massacre occurred in less than fifty years. The bison’s doom wasn’t brought by the First Nations, who hunted the bison for sustenance and whose ancestors had wiped out the bison’s megafaunal compatriots. It wasn’t the American explorers of the early 1800s who shot bison for their tongues (a delicacy in the eastern markets) or their pelts (for the fashion tastes of Europe). Nor was it legendary frontiersmen of the late 1860s like “Buffalo” Bill Cody, who shot the bison en masse to fulfill contracts feeding the railroad construction crews. No, none of these massacres had made a dent in the bison population of sixty million. The death knell for the bison sounded in the east in the form of the industrial revolution. Leather was needed for boots, clothing, and, in the days before synthetic rubber, belts to drive all the new and emerging machinations of industry. Around 1870 a shortage of cow leather forced American and European tanners to look towards experimenting with bison hides and found it to be more elastic and pliant, making it higher quality than cow leather. By 1872 the American bison faced a genocide as their leather was sought to run the machines of industry; machines fueled by oil, gas and coal. By 1883 the great herds were gone. 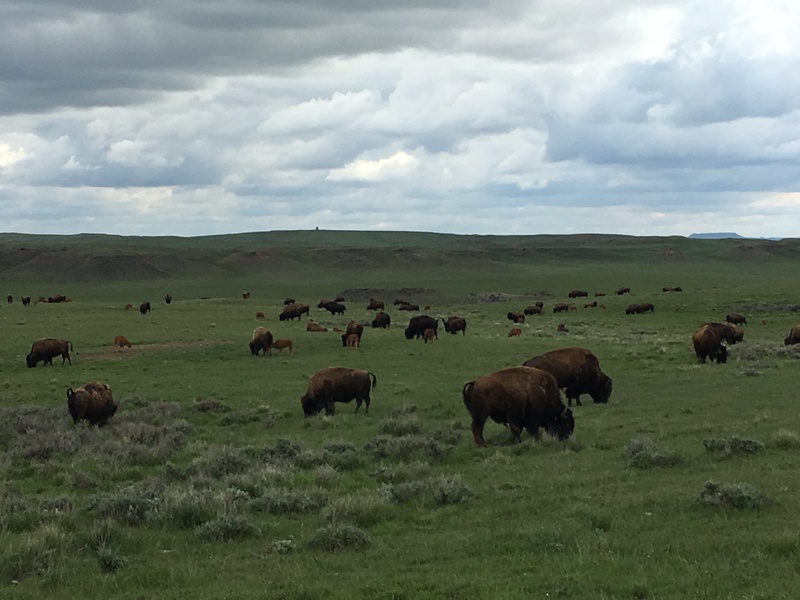 To see bison grazing in and around oil and coal country, amongst the very fuels which aided in their near extinction, has somewhat of a calming and reassuring effect on me. The bison are still here, despite what happened. The worst is behind them; they stared extinction in the face and survived. Today, there are about 500,000 bison in the United States and their population is growing. 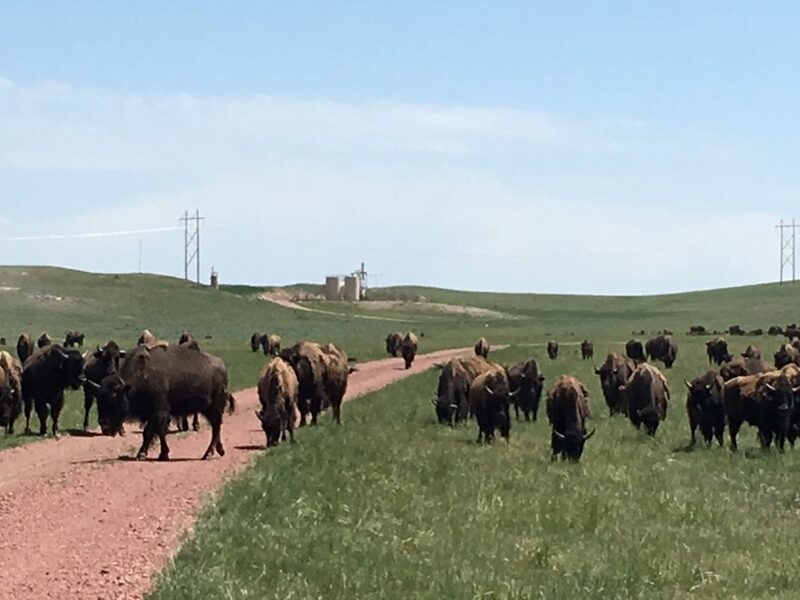 There is a majestic resilience to these animals and I have no doubt that once the wells have been reclaimed and the mines remediated and restored, bison will graze where those structures once stood. This entry was posted in Grazing, Western Research Fellows, Western Resource Fellows, WRF 2017 and tagged Anthony Bell. Bookmark the permalink.